But probably not what you paid for them. 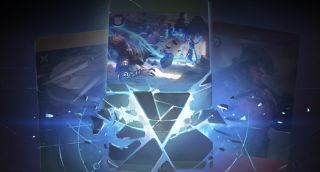 Valve’s changed its tune when it comes to tweaking cards in Artifact. Today’s update brings with it some significant changes to cards like Axe, Artifact’s most expensive card, as well as new features, including account levels and skill ratings. While Valve previously subscribed to the idea that cards should never be altered aside from a few exceptions, its philosophy has shifted considerably. Eight cards have been changed with this update, including several prominent ones like Drow Ranger, Cheating Death and the aforementioned Axe. One of Artifact’s most powerful cards, Axe could be found selling for over $30 at its peak. That’s more expensive than Artifact. It’s now selling for around $7. Artifact’s steep decline in players is likely responsible for the drop, and it’s been going down all month, but the nerf certainly isn’t going to add value to it. The base stats of Axe have gone from 7/2/11 to 6/2/10. It’s still got two armour and his fancy Berserker’s Call ability, but it now does less damage and has less health. I wonder if we’ll start to see even fewer people throwing big bucks around in the marketplace now that there won’t be this expectation that a card will be as powerful today as the day you bought it. If you've bought one of the cards changed by the update, you can sell it back to Valve, but only for the peak price 24 hours before the announcement. If you blew $30 on it, you’re out of luck, though you’ll still be able to claw back around $8. You can sell your cards back to Valve now. Here’s how. Are these changes going to make any of you more hesitant about investing real cash in the game?